I am asked quite frequently to explain some or the common terminology I use when talking and writing about finches. Here I am going to cover most of the popular terminology associated with finch keeping. These are all words you should learn if you plan to keep and breed finches. This is just a list of common words and phrases along with their explanation. This page will grow and develop more over time. Band (banding / banded) - The small plastic or metal ring placed on the bird's leg for identification purposes. ; Banding is the act of putting the band on. 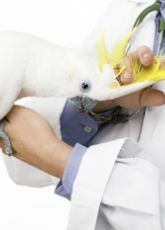 ; Banded means the bird is already wearing a band. Chick - a baby bird. 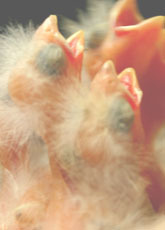 Young birds are often called chicks from the moment they hatch until the become adults. Fledge - The act of leaving the nest once all the necessary feathers have developed. To acquire the feathers necessary for flight or independent activity. Foster - parental care though not related by blood. When some finches wont or can't care for their own chicks, the chicks are given to foster parents (usually Society Finches) to be raised. Hatchling - a baby bird from the moment it hatches until feathers form. Hybrid - an offspring of two different species. Canaries and European Goldfinches are commonly interbred. The result is a hybrid, which is infertile. Inbreed - the interbreeding of closely related individuals. This can be used to bring out desirable traits in a species but it can also result in many physical deformities in the offspring. Inbreeding should not be attempted unless you are a highly experienced breeder and know the genetic history of your finches. Incubate - to sit on (eggs) so as to hatch by the warmth of the body; also to maintain under conditions favorable for hatching & development. Molt - To shed hair, feathers, shell, horns, or an outer layer periodically. All finches will molt as the season change. Mutation - a relatively permanent change in hereditary material involving either a physical change in chromosome relations or a biochemical change in the codons that makes up genes. 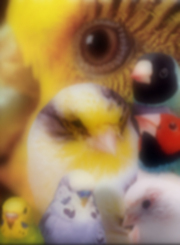 In finches you will find many color mutations within any given species because the species has been bred in captivity for many generations. The Black Breast and Chestnut Flanked White mutations of the Zebra Finch show how differently mutations can appear even if they are from the same species. Necropsy - An autopsy. To perform an autopsy on a dead animal. Nesting - The act of building the nest and sleeping in the nest. Preparing for the arrival of eggs and chicks. Nestling - a baby bird from the time feathers start to develop until it fledges. Plumage - Feathers of the bird. Regurgitate - to become thrown or poured back. Parent finches regurgitate or �spit up' the food they have eaten to feed to their young. Ring - See Band ; Also can refer to a unique feature. The Ring-Neck Parakeet is noted for the ring of color around its neck. Show Quality - A high standard of excellence seen in an individual of a species. 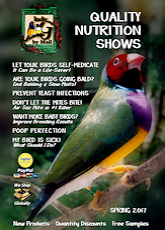 Finches that meet or exceed the current requirements for bird shows are called Show Quality. Stuck in the Molt - The finch has molted but the new feathers are not coming in well. This leaves the finch in a ruffled state with possible bald spots. Species - in the same or like form or kind. There are many species of finches available today, and many look a lot a like. Always know what species of finch you have before attempting to locate a mate. Society Finches and Zebra Finches are examples of two different species. Wean - to detach from a source of dependence. The weaning process takes weeks.